The German language … something I don’t know. The key to learning something new is to relate what you don’t know to what you do know. Germans love their beer … so what better way to learn their language? 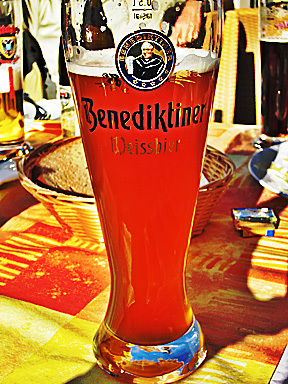 Many English words for beer come from German, so we can use this knowledge as a starting point. Though it’s spelled differently, both languages use the same word – beer or Bier (Why did I capitalize it? See below!) – to describe this much-loved beverage. 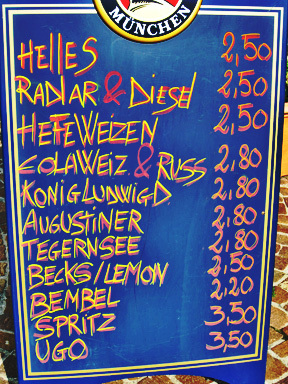 So the good news is… even if you don’t know any German at all, you can always order one of these frosty drinks! Never heard of Weissbier? You may have heard it called Hefeweizen (literally yeast wheat). If you curse while you’re drinking, be aware that if you say “Hell!’ you might end up with another beer in your hands. Hell is the German word for light, and it’s often used to refer to a light beer. No discussion of German beer would be complete without mentioning a beer stein! Stein is the German word for stone. It shouldn’t come as a surprise that Steins are a type of stoneware. But wait – there’s more! There is also a type of beer called Steinbier. It’s made by dropping hot stones into the brew. If you come across one of these, give it a try – this type of beer is becoming quite rare! You’ve completed you first lesson at Beer Language School! You now know the German words for beer, white, light, dark, stone, and to store. You also learned some pronunciation tips and even a little history. By the way … there’s actually a German Beer Institute if you want to learn more! Thanks! Everything in moderation, eh? ← To Market, To Market to Buy a Fat…Horse?